A festival celebrating the life and legacy of David Bowie, his time in Beckenham and beyond. Fans and music lovers worldwide are invited to come together on Saturday 11th August 2018, in Beckenham, South London, to celebrate David Bowie's songs, life and influence, in the park where his rise to stardom began back in 1969. 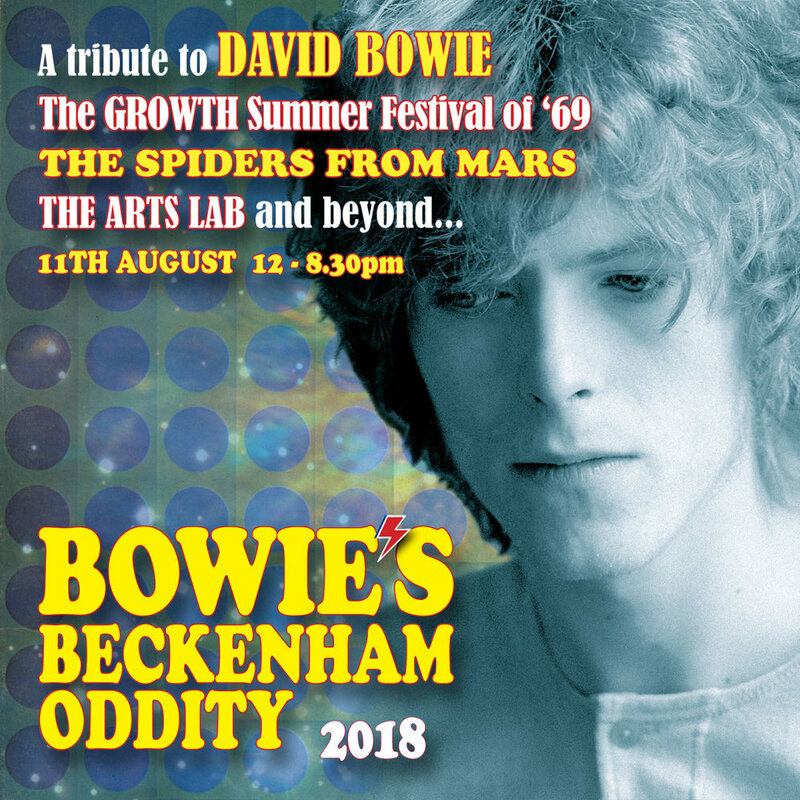 The third “Bowie’s Beckenham Oddity” will take place at Croydon Road Recreation Ground, centred around the same iconic bandstand where Bowie and friends from the Beckenham Arts Lab held the UK’s first Free Festival - “The Growth Summer Festival” - on 16 August, nearly 49 years ago. The festival coincided with the release of David’s first hit single “Space Oddity” and the day was later immortalised with another Bowie single release: “Memory Of A Free Festival”. This year’s event kicks off at 12 noon, with a line-up of musical talent who will reprise Bowie’s greatest songs, including “Life On Mars?”, the career defining classic he wrote whilst sat on the bandstand steps as well as doing some of their own songs. Other attractions include food and drinks by local vendors, a raffle of donated prizes, and the auction of Bowie related memorabilia. Tickets cost £10 adults, £5 for 10 to 16 year olds, and under 10's go free! Tickets are available online in advance here or at the gate on the day of the event. Fans can also support the event via the personalised brick sales, which will be laid in their name around the bandstand on restoration. They can also donate to the “Bowie Bandstand Restoration & Plaque Fund”, which will honour not only David Bowie, but all of the people who took part in the initial 1969 festival. “It’s not just about Bowie, but also all the people who were involved with him along his path to stardom. Brixton has its mural, Aylesbury now has its Earthly Messenger statue, but for me the most real and meaningful place has to be at the bandstand. His ties to the borough and the bandstand are without question; he thrived here, having found the freedom to develop the songs that would later change him, change music and change the world. Slightly off the beaten track, it’s well worth the journey to come along to see it and experience it first-hand. “Bowie’s Beckenham Oddity” is supported by idverde , Bromley Parks, and The London Borough of Bromley, who have named the bandstand “The Bowie Bandstand” in his honour.